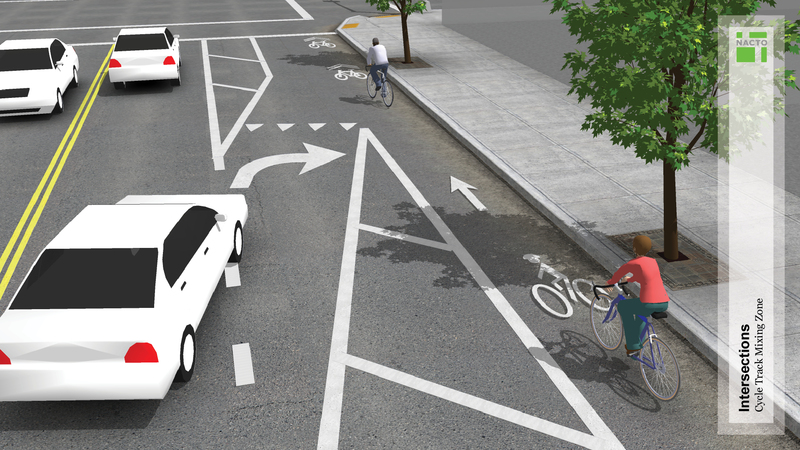 The approach to an intersection from a cycle track should be designed to reduce turn conflicts for bicyclists and/or to provide connections to intersecting bicycle facility types. 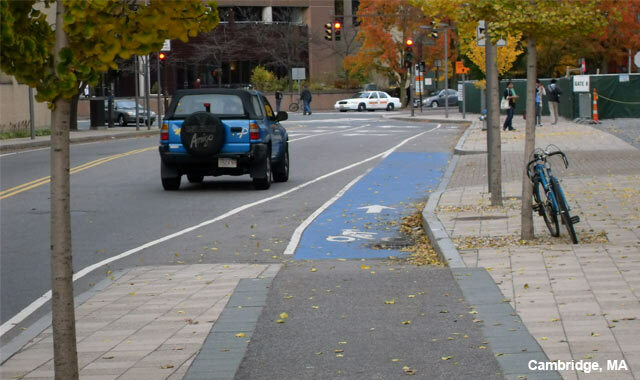 This is typically achieved by removing the protected cycle track barrier or parking lane (or lowering a raised cycle track to street level), and shifting the bicycle lane to be closer to or shared with the adjacent motor vehicle lane. 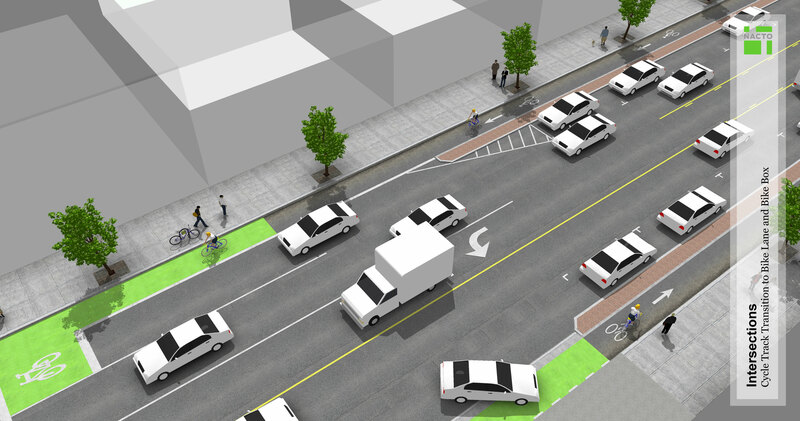 At these intersections, the experience is similar to a conventional bike lane and may involve similar applications of merging area treatments and intersection crossing markings. 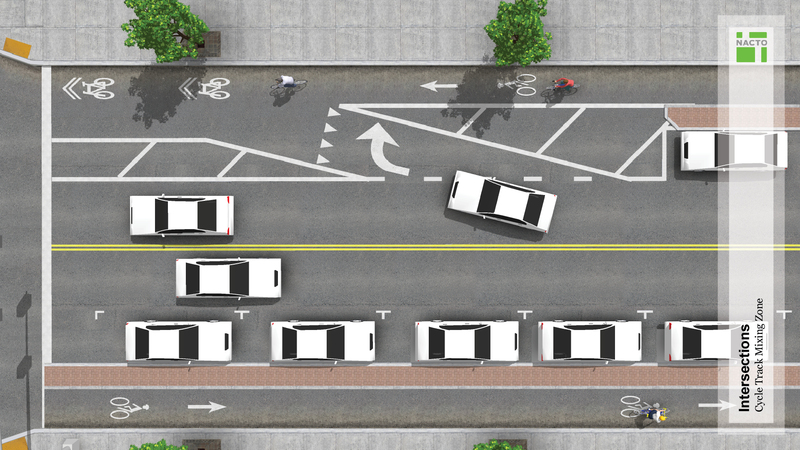 At the intersection, the cycle track may transition to a conventional bike lane or a combined bike lane/turn lane. 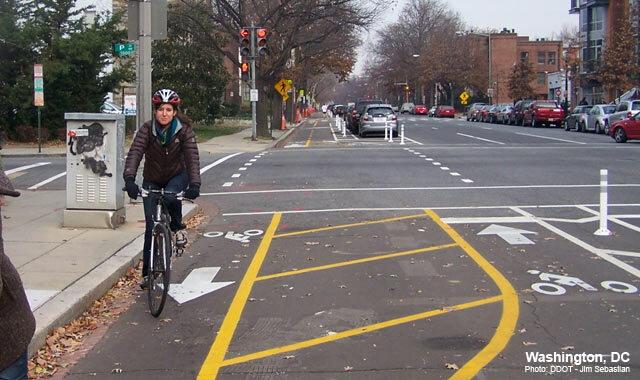 Cycle track crossings of signalized intersections can also be accomplished through the use of a bicycle signal phase that reduces conflicts with motor vehicles by separating in time potentially conflicting bicycle and motor vehicle movements. 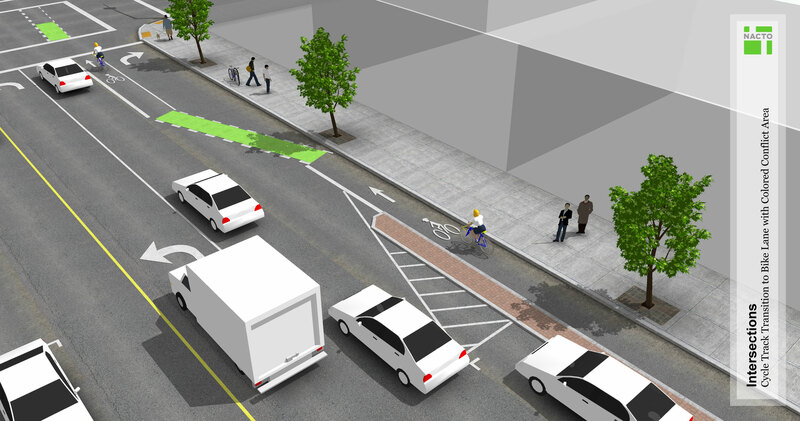 Click on the images below to view 3D concepts of cycle track intersection approaches. The configuration shown is based on Washington, DC, and New York City examples. Increases visibility of bicyclists and motorists in advance of the intersection. Mitigates the risk of “left or right‐hook” crashes with turning motorists. May be less expensive than using full bicycle signals. Where cycle tracks approach intersections where turning movements across the path of the bicyclist (either left or right) is allowed. 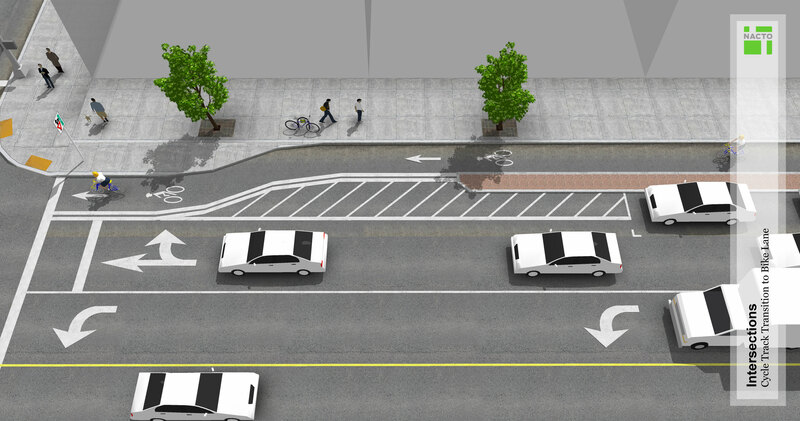 At intersections with a single dedicated right turn lane for motor vehicles. On cycle tracks protected by on street parking or otherwise removed from the travel lane. 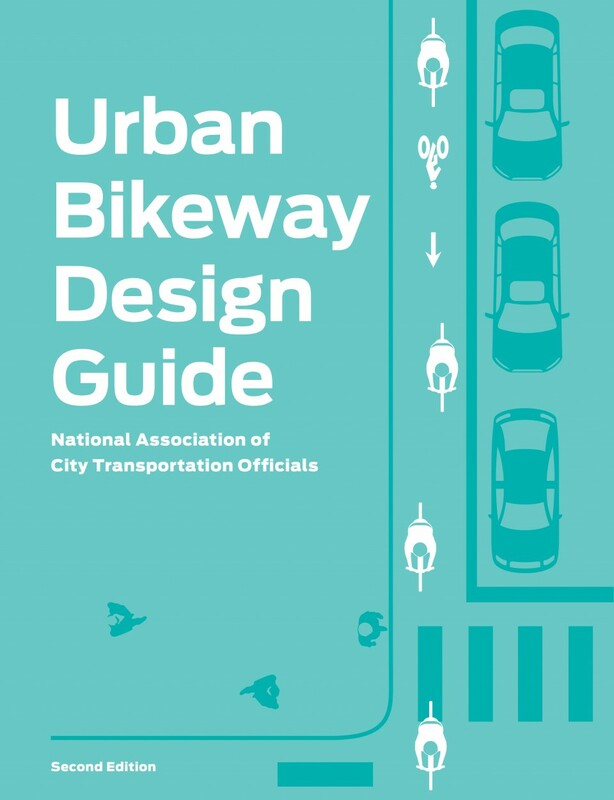 See one-way protected cycle tracks, two-way cycle tracks, and raised cycle tracks for guidance on specific configuration options. 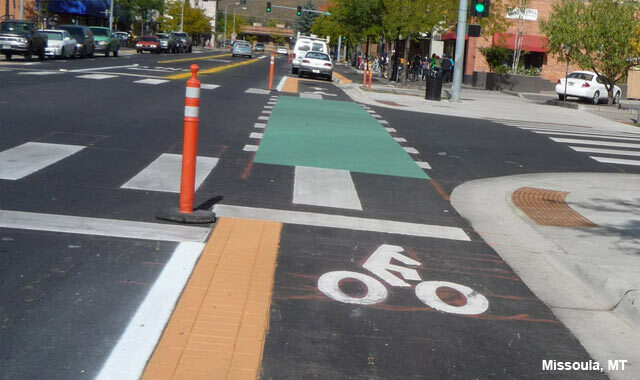 When the cycle track is dropped on an intersection approach, the intersection shall provide some type of bicycle facility to receive cycle track users. 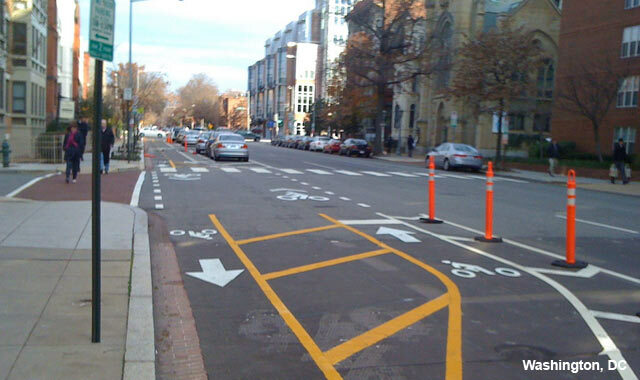 This may be a conventional bike lane, bike box, or combined bike lane/turn lane. Leden, L., Gårder P., Johansson, C. (2005). Traffic environment for children and elderly as pedestrians and cyclists. 18th ICTCT workshop. Parking should be prohibited 30 to 50 feet in advance of where the cycle track buffer ends to promote visibility between bicyclists and motorists. Where it is necessary to route bicyclists from a cycle track to a standard bike lane the transition should be “clear, smooth, safe and comfortable.” Included in the design of the facility should be measures to slow bicyclists down to a safe speed prior to entering/exiting the cycle track. This may be accomplished through the use of ‘Tramline & Ladder’ tactile pavers at the ramps. On the bicyclist path these should run in the direction of travel (‘tramline’). 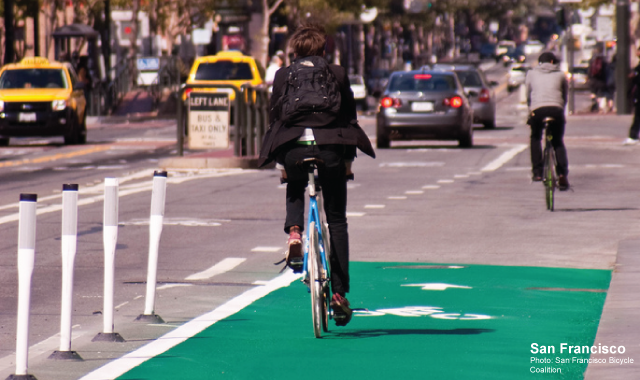 Cycle tracks should be shifted more closely to the travel lanes on intersection approaches to put bicyclists clearly in the field of view of motorists. 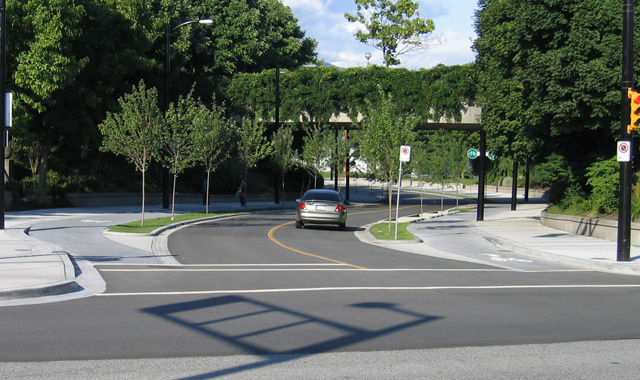 When transitioning from a raised cycle track to street level, the grade should be smooth and comfortable, without significant longitudinal pavement joints or sharp changes in direction. Maximum slope should be 1:8. Intersection crossing markings should be used with truncated cycle tracks to indicate the intended path of bicyclists through the intersection. 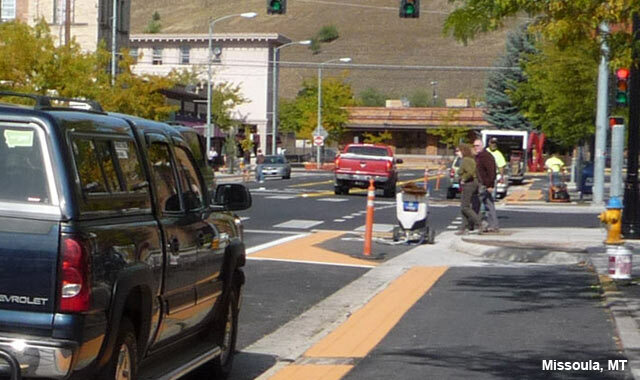 Color may be used to mark conflict areas at intersections with turn lanes, or to extend color applied to the cycle track facility. See Colored Bike Facilities for more guidance. 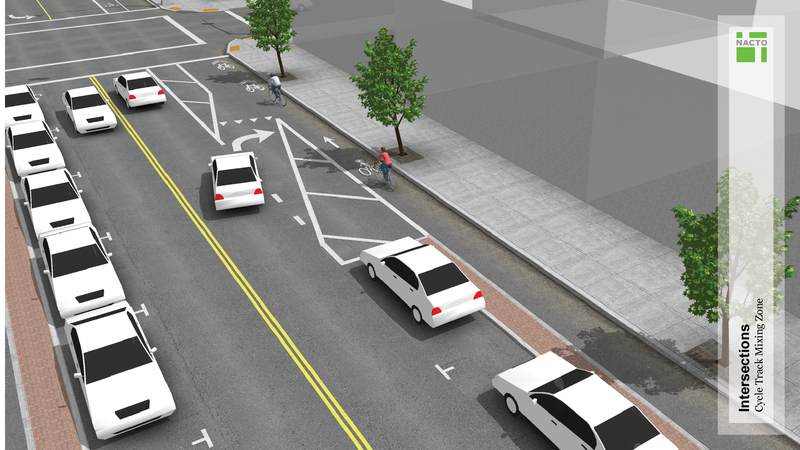 At intersections with heavy right turn movements, the facility may be combined with a bike box or an advanced stop bar to position bicyclists ahead of motorists. 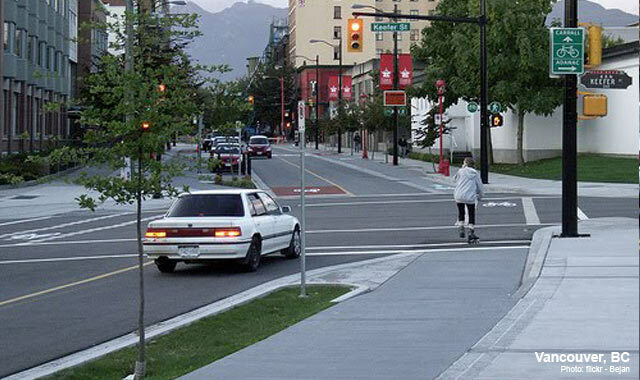 At intersection transit stop locations where separate signal control for the cycle track is possible, consider raising the cycle track to sidewalk level and wrapping the cycle track behind the transit stop zone to reduce conflicts with transit vehicles and passengers. Bicyclists should yield to pedestrians in these areas.Where separate bicycle signal phase is not possible, an extended mixing zone may be provided with signage directing bicyclists to yield to buses and loading passengers.Cycle tracks may be configured on the left side of a one-way street to avoid conflicts at transit stops. 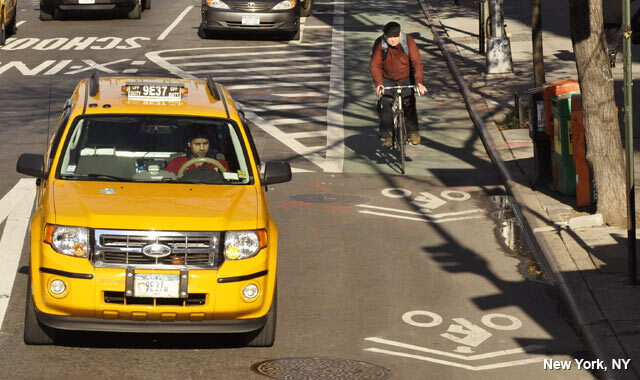 A bicycle exclusive signal phase may be used to segregate conflicting movements between bicyclists and motorists. Maintaining markings should be a high priority. 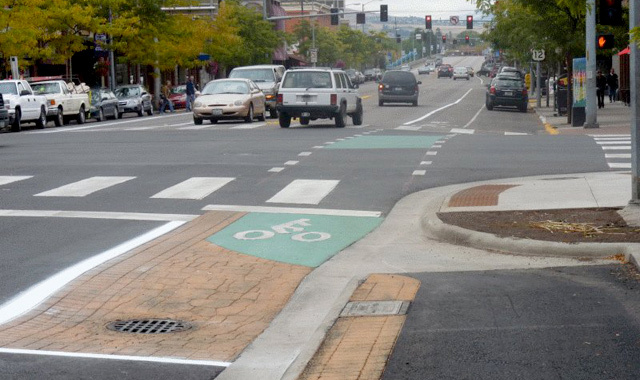 References for Cycle Track Intersection Approach: 11 found.